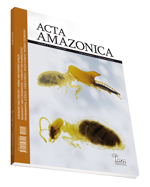 Authors: ALENCAR, J. da C.; FERNANDES. N. P.
Authors: BASTOS, C. N.; EVANS. H. C.
Title: Desempenho de 15 variedades de soja plantadas em terra firme, na Fazenda Araçá, Manaus, em 1976. Authors: FREIRE, F. das C. O; FREIRE, T. de A. Authors: FREIRE, F. das C. O; MONTEIRO, A. R.
Authors: LLERAS, E.; MEDRI, M. E.
Authors: CHARLWOOD, J. D.; HAYES, J. Authors: CHARLWOOD, J. D.; PARALUPPI, N. D.
Authors: GORAYEB, I. S.; PINGER, R. R.
Title: Estado atual da sistemática dos peixes de água doce da América do Sul. Authors: BÖHLKE, J. E.; WEITZMAN, S. H.; MENEZES, N. A. Authors: RATCLIFFE, B. C.; PENNY, N. D.
Authors: OREN, D. C.; SMITH, N. J. H.
Authors: KERR, W. E; POSEY, D. A.;WOLTER FILHO, W.
Authors: MAIA, J. G. S.; VAREJÃO, M. J. C.; WOLTER FILHO, W.; MOURÃO, A. P.; CRAVEIRO, A. A.; ALENCAR, J. W.
Authors: FINK, W. L.; FINK, S. V.
Authors: FYHN, U. E. H.; FYHN, H. J.; DAVIS, B. J.; POWERS, D. A.; FINK, W. L.; GARLICK, R. L.
Authors: POWERS, D. A.; FYHN, H. J.; FYHN, U. E. H.; MARTIN, J. P.; GARLICK, R. L.; WOOD, S. C.
Authors: POWERS, D. A.; MARTIN, J. P.; GARLICK, R. L.; FYHN, H. J.; FYHN, U. E. H.
Authors: BUNN, H. F.; RIGGS, A. Authors: REICHLIN, M.;DAVIS, B. J. Authors: REICHLIN, M.; DAVIS, B. J. Authors: FARMER, M.; FYHN, U. E. H.; NOBLE, R. W.
Authors: WEBER, R. E.; WOOD, S. C.; DAVIS, B. J. Authors: MARTIN, J. P.; BONAVENTURA, J.; FYHN, H. J.; FYHN, U. E. H.; GARLICK, R. L.; POWERS, D. A. Authors: PHELPS, C.; FARMER, M.; FYHN, H. J.; FYHN, U. E. H.; GARLICK, R. L.; NOBLE , R. W.; POWERS, D. A. Authors: GALDAMES-PORTUS, M. I.; NOBLE, R.W. ; FARMER, M.; POWERS, D. A.; RIGGS, A.; BRUNORI, M.; FYHN, H.J. ; FYHN, U. E. H.
Authors: WOOD, S. C.; WEBER, R. E.; POWERS, D. A. Authors: FOCESI, A.; BRUNORI, M.; BONAVENTURA, J.; WILSON, M. T.; GALDAMES-PORTUS, M. I. Authors: BRUNORI, M.; BONAVENTURA, J.; FOCESI JR. A.; GALDAMES-PORTUS, M. I.; WILSON, M. T.
Authors: WEBER, R. E.; WOOD, S. C.
Title: Efeitos da respiração aérea sobre o balanço ácido-base no cascudo Hypostomus sp. Authors: WOOD, S. C.; WEBER, R. E.; DAVIS, B. J. Authors: RIGGS, A.; FYHN, H. J.; FYHN, U. E. H.; NOBLE, R.W. Authors: MARTIN, J. P.; BONAVENTURA, J.; BRUNORI, M.; GARLICK, R. L.; POWERS, D. A. Authors: MARTIN, J. P.; FYHN, H. J.; FYHN, U. E. H.; GARLICK , R. L.; NOBLE R,W. ; POWERS, D. A. Authors: MARTIN, J. P.; BRUNORI, M.; GARLICK, R. L.; POWERS, D. A. Authors: GARLICK, R. L.; BUNN, H. F.; FYHN, H. J.; FYHN, U. E. H.; MARTIN, J. P.; NOBLE, R.W. ; POWERS, D. A. Authors: PHELPS, C.; GARLICK, R. L.; POWERS, D. A.; NOBLE, R. W.; MARTIN, J. P.
Authors: FARMER, M.; WEBER, R. E.; BONAVENTURA, J.; BEST, R. C.; DOMNING, D.
Authors: GARLICK, R. L.; DAVIS, B. J.; FARMER, M.; FYHN, H. J.; FYHN, U. E. H.; NOBLE, R. W.; POWERS, D. A .; RIGGS, A.; WEBER, R. E.
Authors: WILSON, M. T.; BONAVENTURA, J.; BRUNORI, M .
Authors: BONAVENTURA, J.; BRUNORI, M.; WILSON, M. T.; MARTIN, J. P.; GARLICK, R. L.; DAVIS, B. J.